Brunch is my favorite meal of the week. Looking forward to bottomless coffee, delicate eggs and home fries amongst friends keeps me chugging along Monday to Friday. This week, I wanted pancakes. 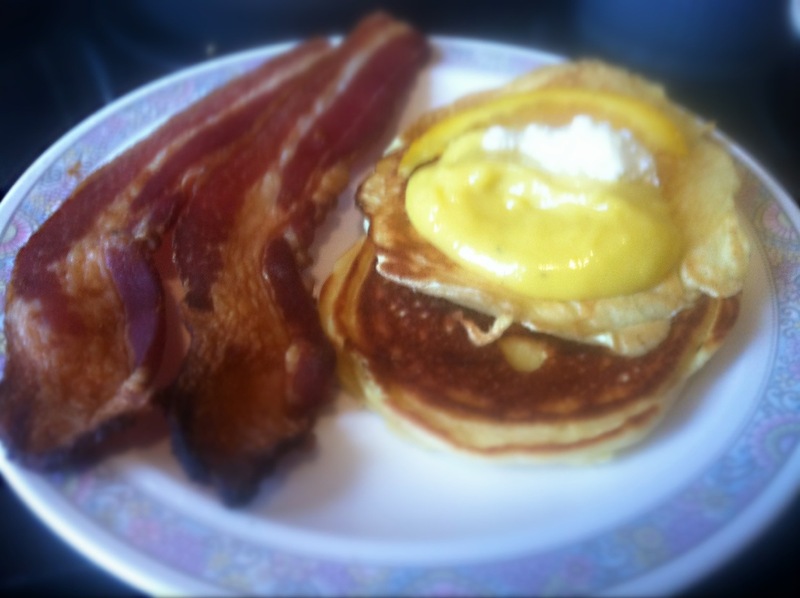 Delicious, fluffy pancakes to go along with leftover lemon curd and the salty, smoky bacon I had in my fridge. Makes 8 – 10 pancakes. Serve with fancy shmancy cocktails. 2. Whisk together the egg yolks, ricotta, honey, vanilla and the lemon zest. When combined, whisk in the flour and stir til all lumps are dissolved. 3. Using a whisk or electric mixer, beat the egg whites til they form stiff peaks. Then, with a spatula, gently fold the whites into the batter a little bit at a time. Use a light touch so you don’t overwork the mixture. 4. Heat a griddle over medium heat until hot, then brush with canola oil and melted butter. Ladle the batter onto the griddle, leaving atleast an inch or two between pancakes. Work in batches if necessary. Cook the pancakes for about 2 minutes each side til golden (the pancakes will bubble when they’re ready to be flipped). Add more canola oil and butter to griddle as needed. 5. When cooked, transfer the pancakes to a baking tray to and keep warm in oven til ready to serve. Serve with a dollop of ricotta and maple syrup.